A satellite tagged green turtle swam 900km in 28 days, visiting three UK overseas territories and revealing the migration routes taken by the species. The turtle, named Suzie by scientists, was released from the Turks and Caicos Islands at the end of June. She spent two months in their waters before starting to migrate. Scientists plan to tag six turtles, aiming to reveal the full range of the endangered green turtle and the critically endangered hawksbill turtle. Two male hawksbill turtles have been tagged within the past week, the most recent on Wednesday night local time. Scientists from the Turks and Caicos Islands Turtle Project have secured satellite transmitter tags to the animals' shells. These transmit when the turtles surface to breathe. Satellites receive the signals and calculate their locations. Scientists on the Turks and Caicos Islands will track the turtles' movements via the internet, using the a computer programme which can plot online maps of the animals' movements each day. Suzie was caught and named by fishermen on South Caicos, according to Wesley Clerveaux, director of the country's department of environment and coastal resources. He said: "Our project officers on the island are putting up the maps of Suzie's journey on walls and notice boards each day and doing a great job of keeping the South Caicos locals informed. "They are very interested and will stop our officers in the street to ask 'where's Suzie at now?'. Other collaborators in the initiative are the School for Field Studies in Turks and Caicos, the UK-based Marine Conservation Society (MCS) and the University of Exeter. Peter Richardson of the MCS said: "Suzie's journey is a remarkable first. 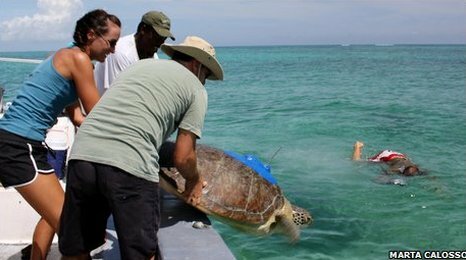 "She was the first turtle ever to be fitted with a satellite tag in the Turks and Caicos Islands. Her journey has told us, for the first time, that three of the UK Overseas Territories in the Caribbean, hundreds of kilometres apart, share green turtle populations." The MCS and the University of Exeter are working closely with the Turks and Caicos Islands Government to improve management of the turtle fishery. 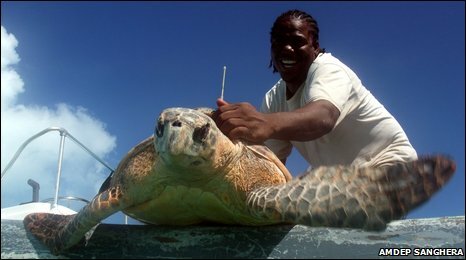 Of the UK Overseas Territories in the Caribbean, currently only the government of Anguilla has imposed a ban on all turtle fishing - for 15 years from 2005 - to allow populations to recover.